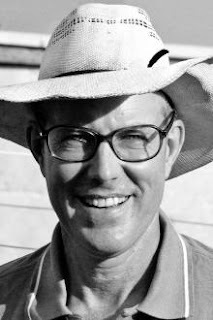 Check out this interview with Joel Salatin, a farmer, writer and activist. I encountered Farmer Joel first when I read Pollan's "In Defense of Food " and again when I watched the movie "Food inc ." If you're not sure where you stand when it comes to food production, Joel Salatin will mobilize you. From definitions of organic-- and the limitations of that certification-- to how we treat our soil, I get a sense of how complex our food system really is, and how broken. "I suggest that aiding and abetting Walmart is a fundamentally flawed exercise if your goal is localization, decentralizing, integrity, transparency, and triple bottom line accounting. Walmart business models do not include the question: "Does this make more earthworms or fewer?" A few pennies tossed to environmental organizations do not make a company green." "Remember, cancer is growth. Growth in and of itself is neither healthy nor noble. And so as I've searched for noble goals for our farm, I've found great freedom in being liberated from competing with farmers outside my bioregion."